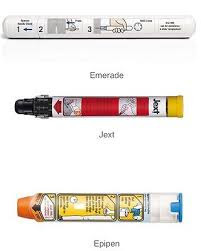 Schools given permission to keep emergency Auto-Injectors for Anaphylactic Reactions! For further information, please contact the Communications team at Allergy UK. Anaphylaxis is a severe and potentially fatal allergic reaction. Adrenaline is the first-line emergency treatment. BSACI (British Society for Allergy and Clinical Immunology) is the national, professional and academic society which represents the speciality of allergy at all levels. Its aim is to improve the management of allergies and related diseases of the immune system in the UK, through education, training and research. The Anaphylaxis Campaign is the only UK-wide charity operating solely for the growing number of people at risk from severe allergic reactions and anaphylaxis. Allergy UK is the leading national patient charity providing a wide range of support, advice and information for those living with allergic disease. RCPCH (The Royal College of Paediatrics and Child Health) plays a major role in postgraduate medical education, professional standards, research and policy towards its mission to transform child health through knowledge, innovation and expertise. BPAIIG (The British Paediatric Allergy, Immunity and Infection Group) is an affiliated specialist group of the RCPCH with members actively involved in the clinical care of children as well as in research and development of new methods of investigation and treatment of allergic, immune and infectious conditions.